Is your current pool deck too hot, too slippery, cracked, chipped, stained, pooling water, rough on the feet, or just plain boring? Prestige Deck Coating and OC pool deck resurfacing specializes in turning existing concrete, and pool decks that are deteriorated, worn-out or outdated, into new, updated and great looking deck surfaces. We have the experience to complete your concrete resurfacing project from start to finish, in a timely fashion, while paying particular attention to even the smallest details. Assessment. Our expert estimators arrive at your home or commercial location ready to assess your situation. First, we analyze the trouble spots and address any issues you want to discuss. Any delamination, rough areas, cracks, rust spots, or slippery surfaces are detected and noted. It is important for us to give you a true picture of what sort of repair and resurfacing options will best serve your needs. Second, we precisely measure the whole area to be resurfaced. Our estimators then reconvene with the customer to report findings and relay an approximate time of sending out the proposal. Prestige takes the assessment step in pool deck resurfacing seriously. After we send out our detailed proposal form via email, typically with “best” and “worst” case scenario options. We want no surprises to upset your lifestyle. We will follow up to make sure you received the information. Upon accepting our industry competitive prices, we schedule around your calendar as best as we are able. Our OC pool deck resurfacing specialists arrive each day on the site in a timely manner and leave a mess free workplace. We keep our customers informed of our progress and any issues discovered once we delve into the work. System. We use two layers of polymer based concrete to reduce any chance of cracking or leaking. Our commercial and residential pool deck products are professionally installed giving your backyard pool area a new beautiful look. Our pool deck resurfacing system has a anti-slip grip finish texture, making your slippery concrete safe to walk on even when wet. With an assortment of stylish colors and textures, we make your outdoor living area a relaxing pleasure. There is no need to break apart and remove your existing concrete, we can patch and cover your old concrete with our durable pool deck materials. Unlike starting an entire new installation from the ground up, our pool deck resurfacing systems will protect your pool deck surface like it was new again. Prestige Deck Coating and OC pool deck resurfacing can completely remodel your pool deck, just in time for summer. 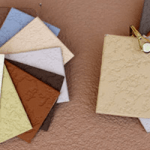 We can provide you with texture and color samples, for all your aesthetical concerns. 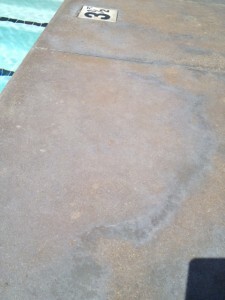 Don’t go through the huge cost of tearing out and re-pouring your pool deck. Resurface it! If your deck is in reasonably good shape (no major cracks), our OC pool deck resurfacing system is the best choice for you. Even with some cracking, we can repair your existing pool deck. No need to hire a general contractor, hire a licensed deck resurfacing expert. Call Prestige Deck Coating, and beat the heat!